It was always great to return to a city you have explored in the past. 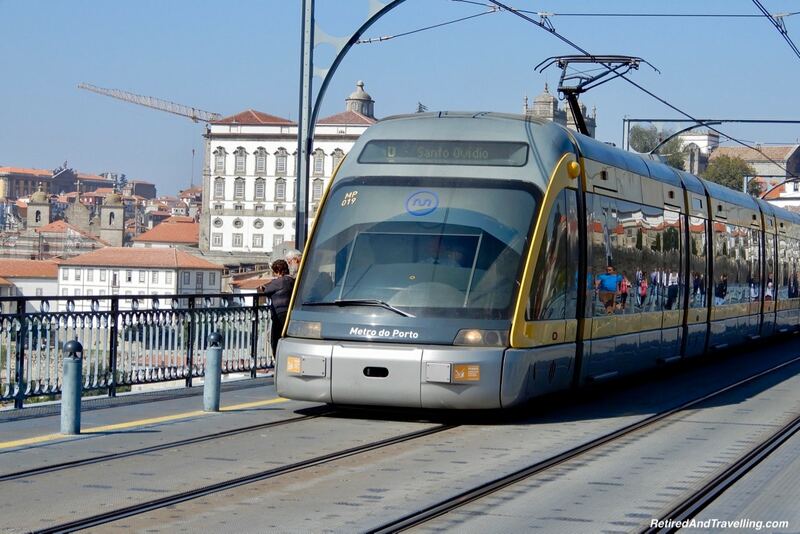 We visited Porto in the spring and were back for a day stop on our northern Europe cruise. We had explored much on our last visit. 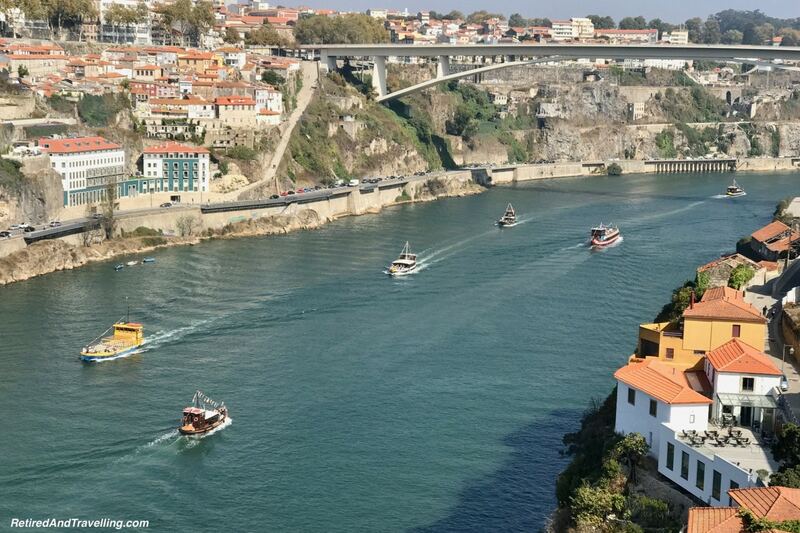 But on this trip we planned a port tasting in Porto. Port is a sweet wine that comes from certified regions in the Douro River Valley in Portugal. 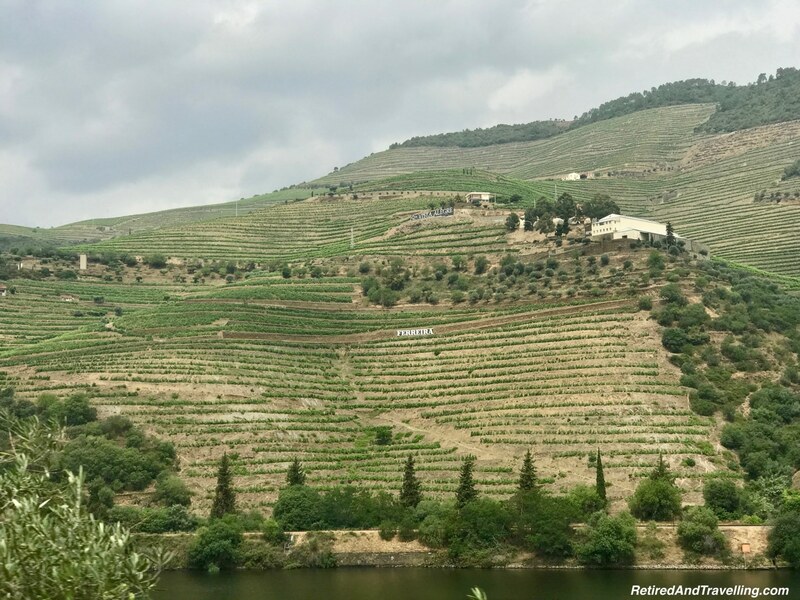 We saw the regions where the vineyards were when we travelled along the Douro River Valley. Now it was time for more tasting! 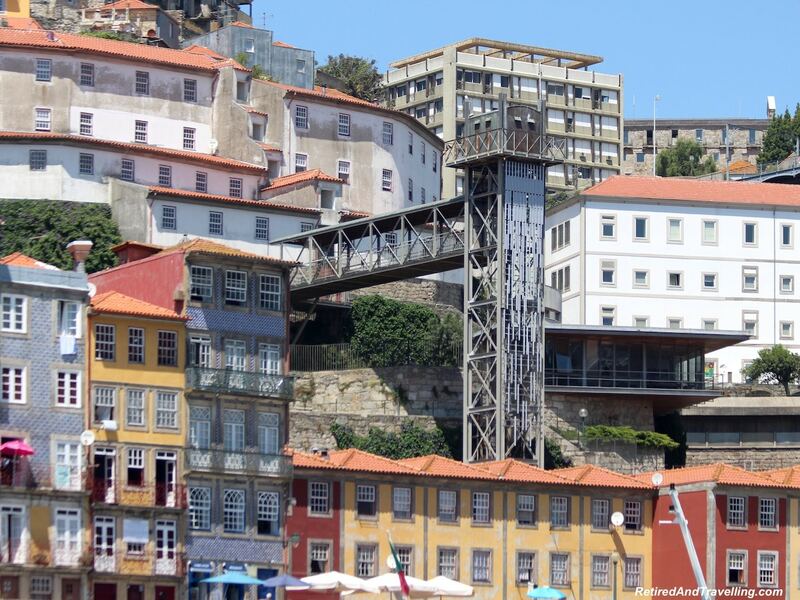 The cruise itinerary said we were docked in Porto. But we were really not in Porto. 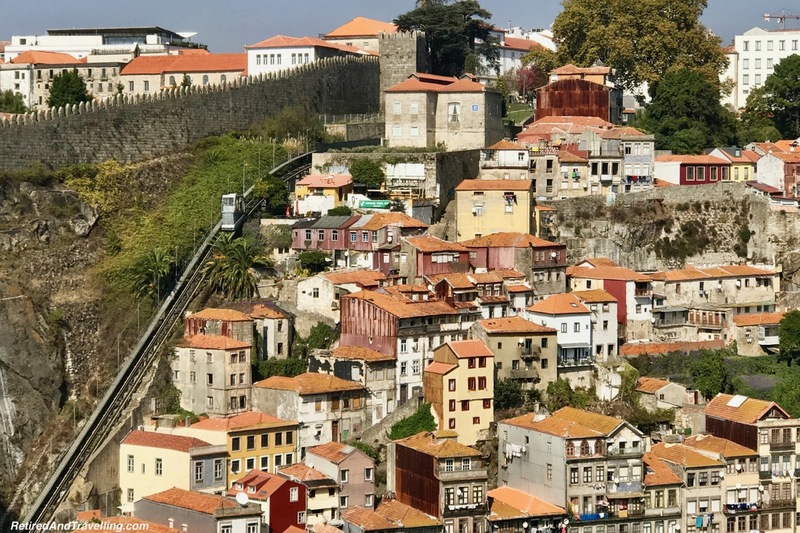 The trip into town from the cruise port in Leixões was a long shuttle ride. We knew where we were going, so decided it would be more direct by public transit. Our decision to come back by taxi seemed like a smart one. Until we ran into a major accident on the Arrabida Bridge that we needed to cross to get back. We made it with minutes to spare. It would have been easy to make our way to the next port in Lisbon. But we were not sure how our luggage would be packed to leave the ship in Lisbon the next day! 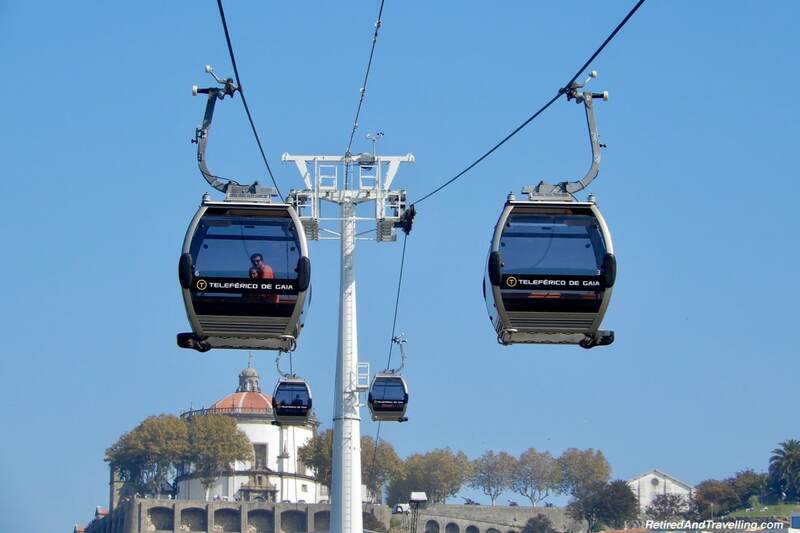 We took the metro to the Morro Gardens high above the Douro River. We enjoyed our river cruise on the last trip. From high above the river we looked down and watched the boats cruising the river. On our last visit we found many ways to go up and down the hills to the riverfront. 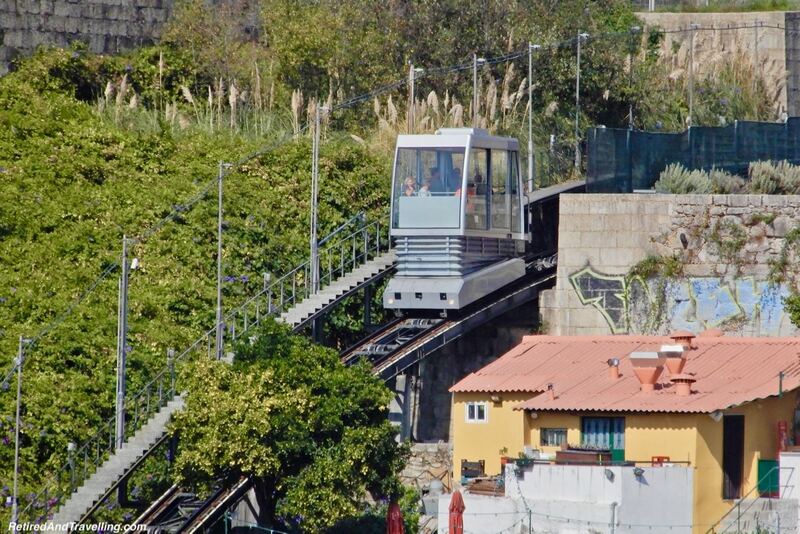 We watched the funicular go up the hill and looked out at the elevator that doesn’t quite get to the Se Cathedral without a walk up. 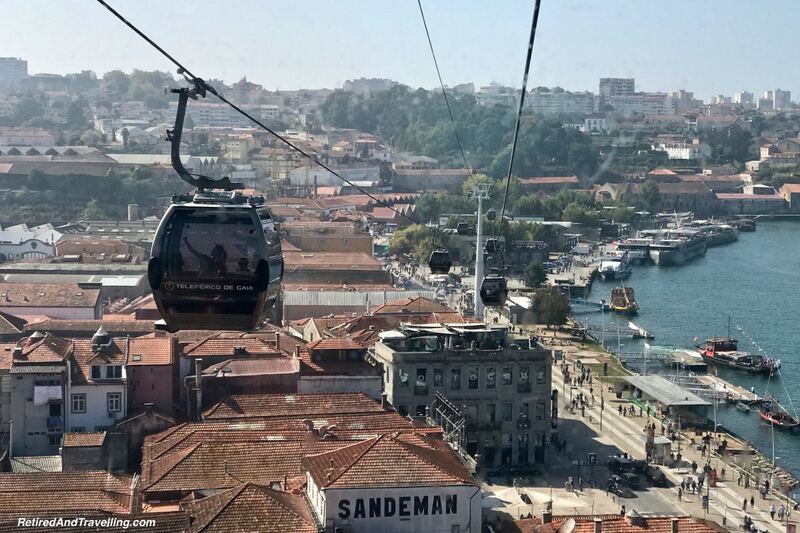 This time we took the cable car (Teléferico de Gaia) down to the river. The station was close to where the metro let us out. We enjoyed the view on the way down. On one side was the river and on the other we saw the port houses. 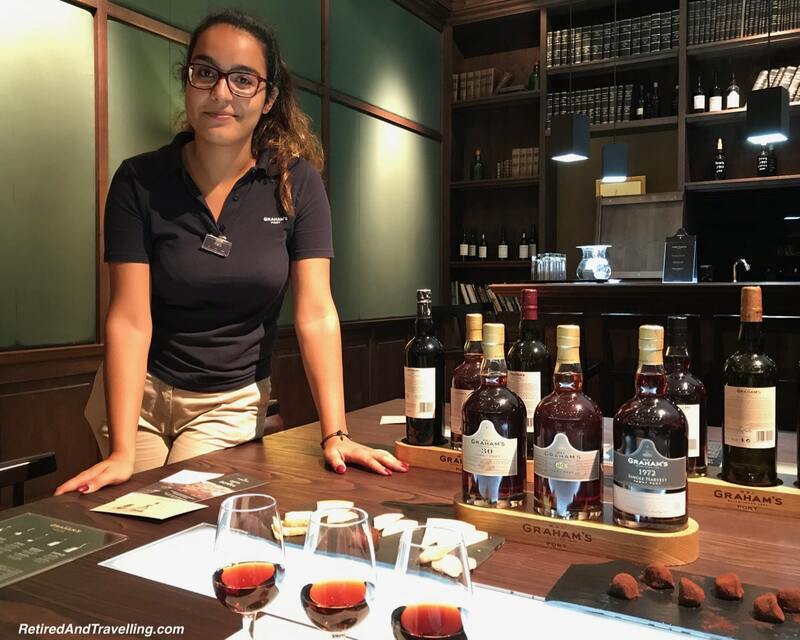 We were in the right spot for a port tasting in Porto! 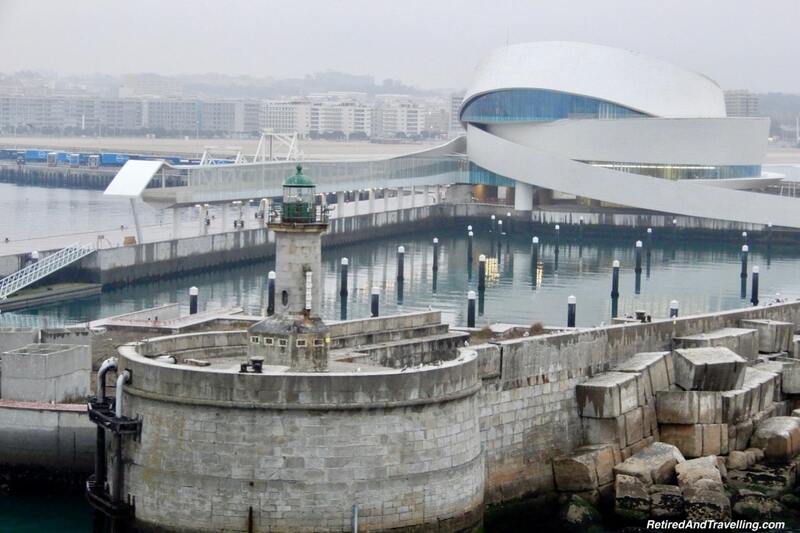 This side of the river was filled with restaurants, bars and port houses. For a moment, we got distracted by the small stall that sold gelato and custard (nata) tarts. 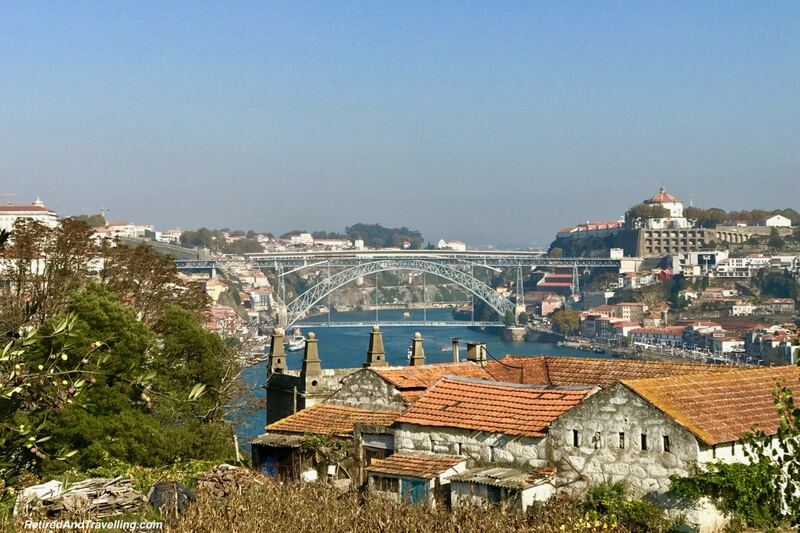 We did not have a specific plan for our port tasting in Porto. We hoped to wander and taste. In retrospect we would have done better with a little research in advance. The Sandman port house had been recommended but it looked like it was in the busy tour bus part of town. 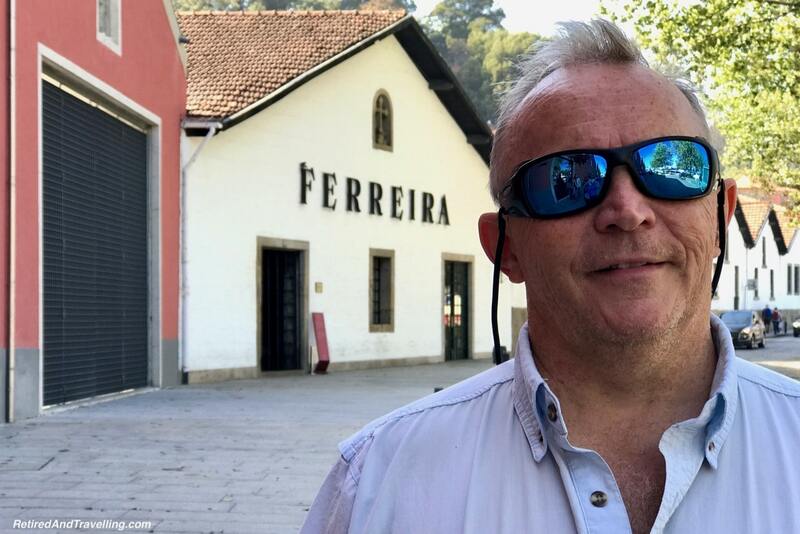 When we drove along the Douro Valley, we saw a lot of signs for the Ferreira vineyards. 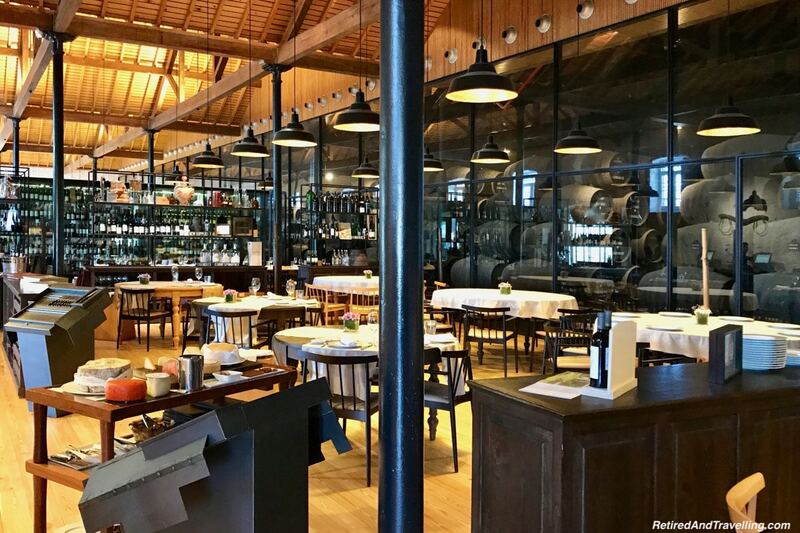 We wandered into the Ferreira cellar in Porto without a reservation. This cellar did not have a separate tasting room. You could only do a tasting at the end of a tour. And we needed to wait too long for the next tour. 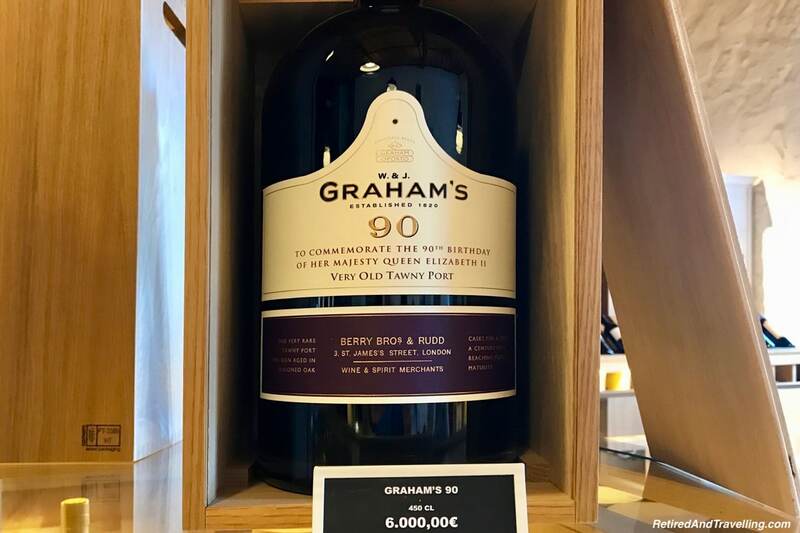 Sarah and Tom at @TripGourmets recommended that we try the Graham’s Port Lodge. I marked the cellar on my offline map. There were contour lines on the map so I knew it was an uphill walk. But it was a very good workout before our port tasting in Porto! 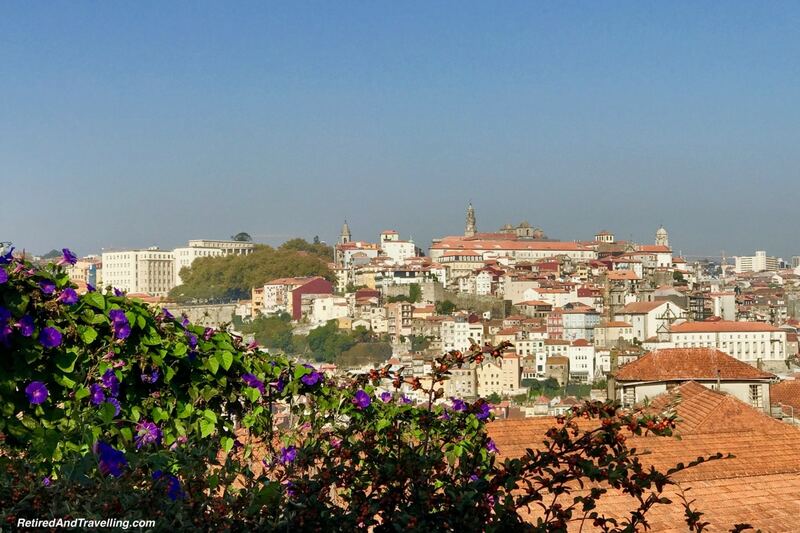 The climb was worth it for the views from the terrace on a commanding ridge in Vila Nova de Gaia. 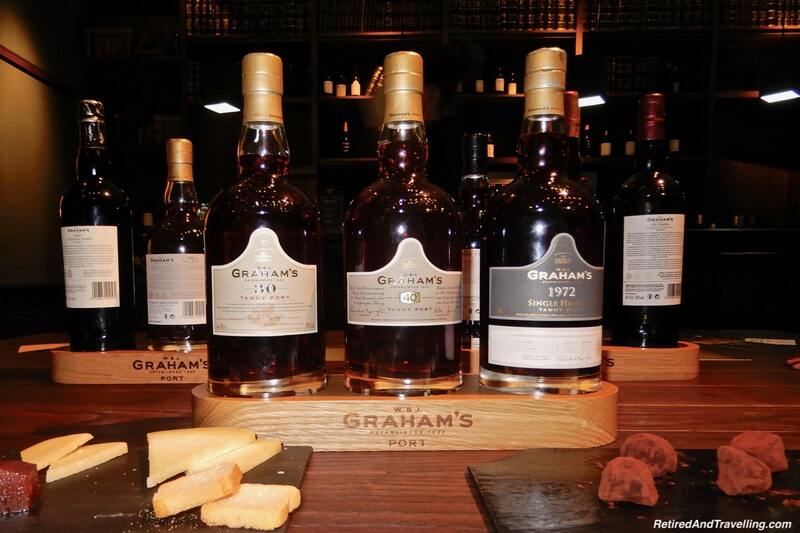 We had numerous options at Graham’s for our port tasting in Porto. We could do a full tour and tasting. The Vinum Restaurant & Wine Bar looked great and the sunny patio was open. We could buy our port by the glass on the patio. Large group tastings were also available. 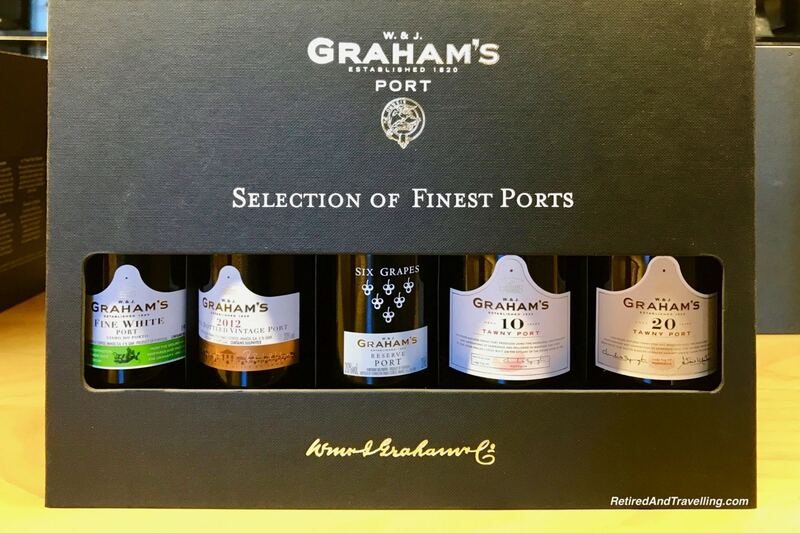 Or you could get a private tasting if you wanted to try the better ports. 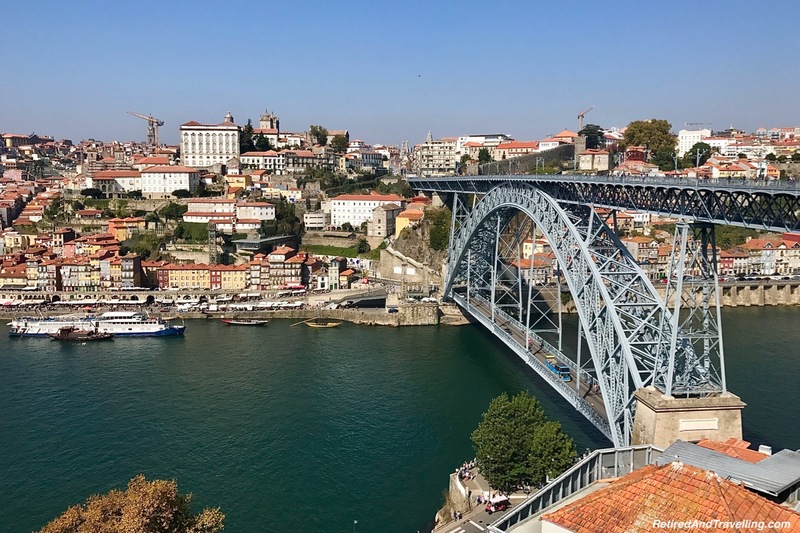 We had tried port on our last visit to Porto and again when we stayed in the Douro Valley. We learned that the older vintages were definitely better. So for our port tasting in Porto we wanted to try the much better vintages. We selected a tasting that let us sample 30 and 40 year old port. We also tried the single harvest “1972” port (a “colheita”). A cheese and a dark chocolate truffle plate showed us how the taste changed with different pairings. 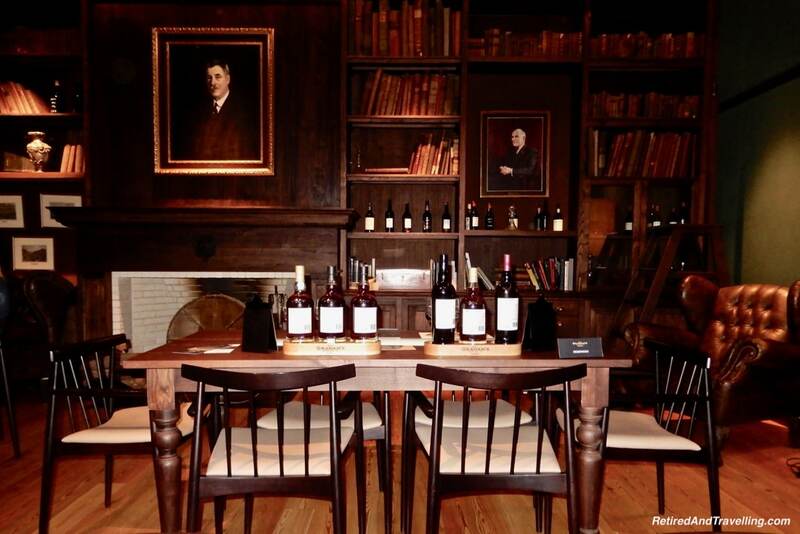 We headed off to the Private Vintage Room – a quiet and beautifully decorated tasting lounge. Pedro and Ana explained a little about the port we would be trying. The ports we sampled were all aged tawny ports. We learned there were 3 other types of port – ruby, rosé and white (from green grapes). 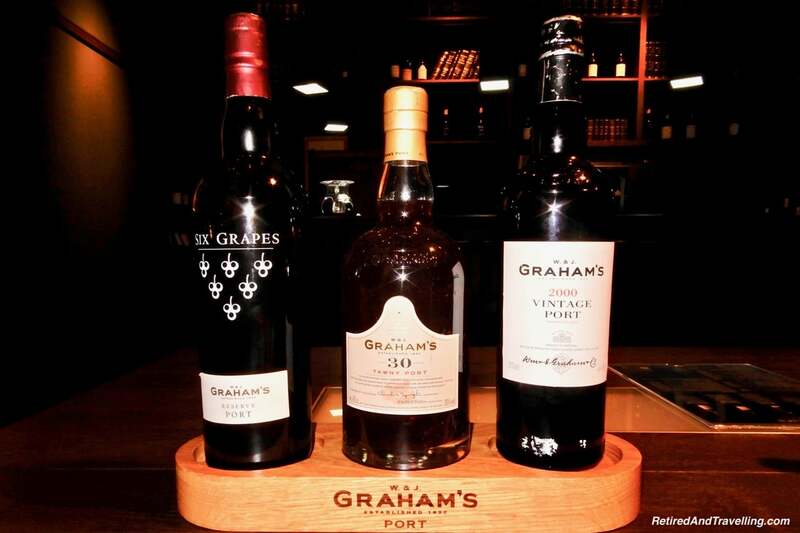 Port is a sweet wine with flavours of raspberry, blackberry, caramel, cinnamon and chocolate. It was no wonder that we found that the chocolate truffles were the best pairing with the port. Who would know that a port tasting in Porto would also get us chocolate! There was not much left when we finished our tasting! 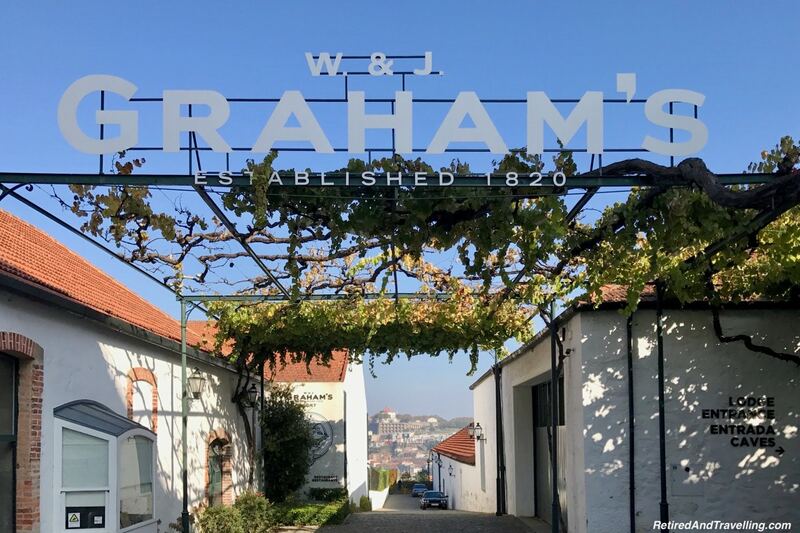 We wandered around the large Graham’s Lodge Shop when we finished our port tasting in Porto. David and I were divided as usual on which port we liked. David liked the sweeter 40 year old port. 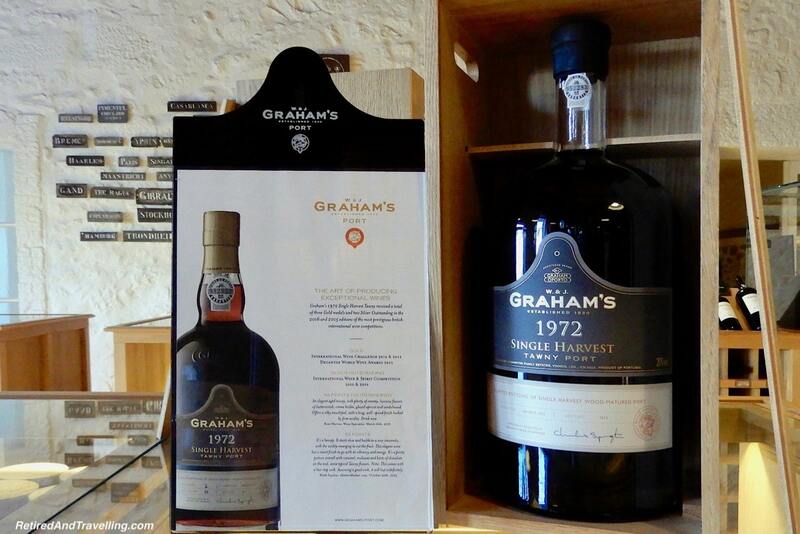 I liked the special 1972 port with its little taste of citrus. The bottles came in various sizes. There were sample bottles if you wanted to take home a variety. If you wanted to buy the select vintages, you better have some room on your credit card limits. 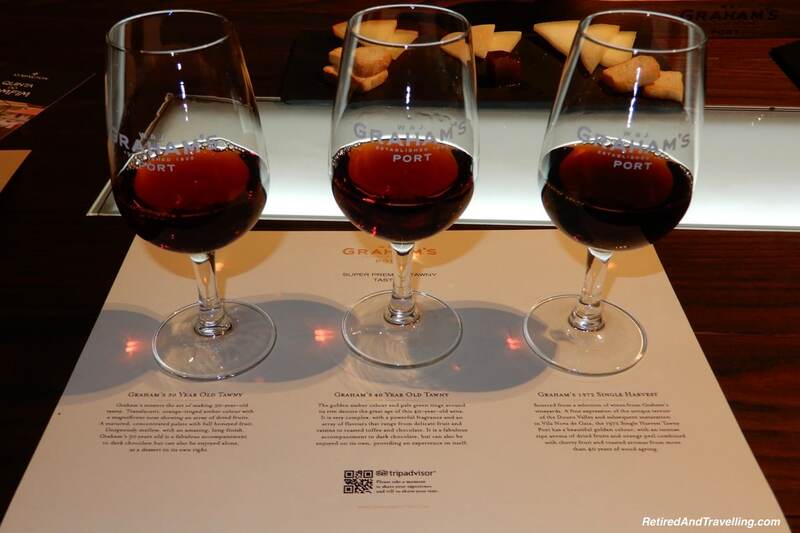 We enjoyed our chance to do a port tasting in Porto. It was always great to get a local special product. 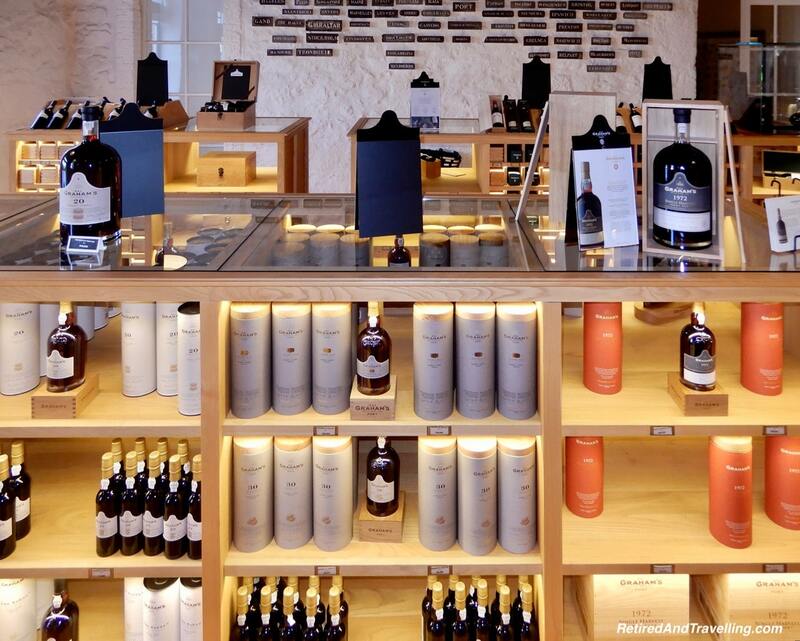 When we visited Madeira, we made sure to try Madeira wine. It too was a rich sweet red wine. 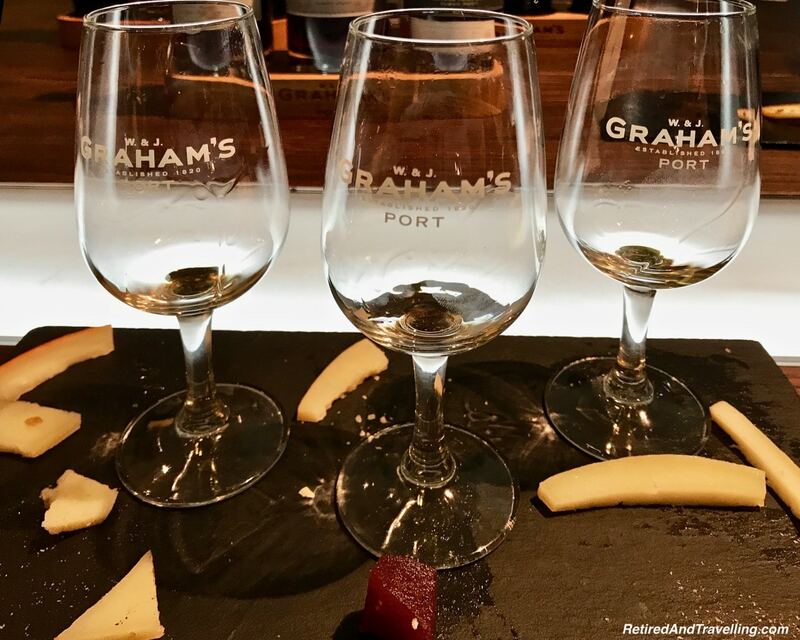 We learned a little bit more with each chance we got to sample port. 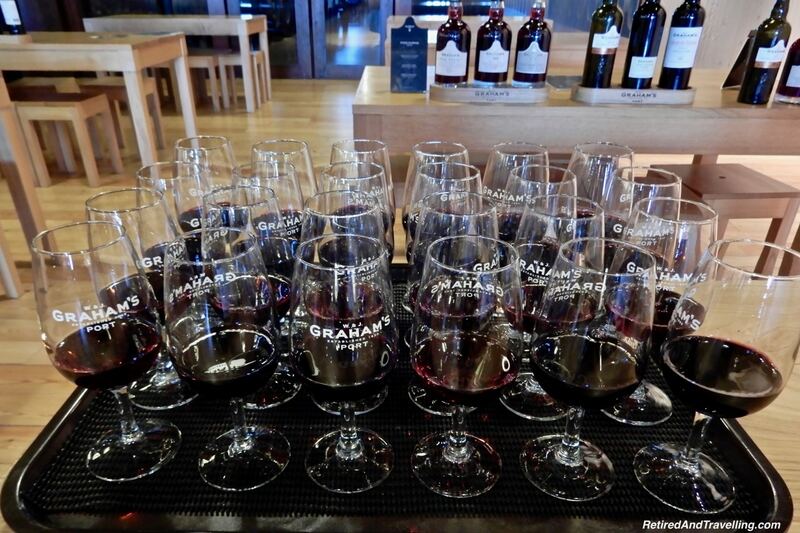 Doing a tasting with a food pairing made all the difference for our port tasting in Porto. 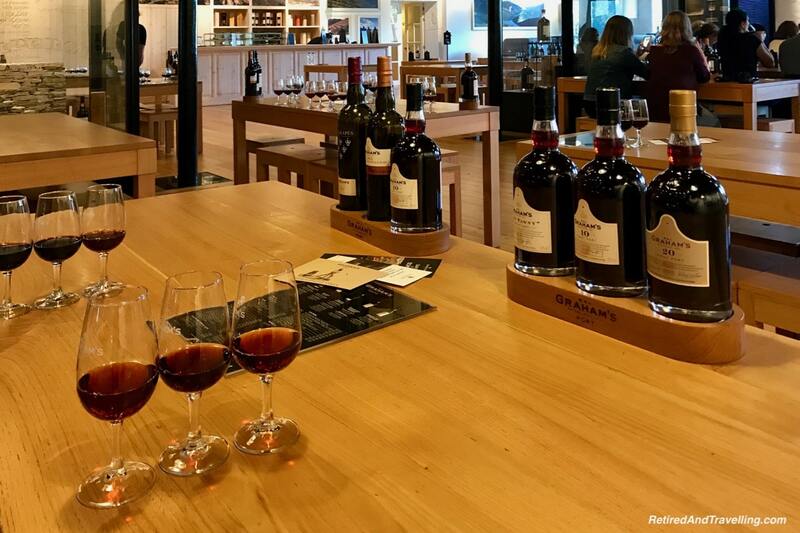 When we did our wine tour in Bordeaux and then a cognac tasting in Cognac, it was hard to get a real sense of the taste without food. We were so happy to be back in Portugal. 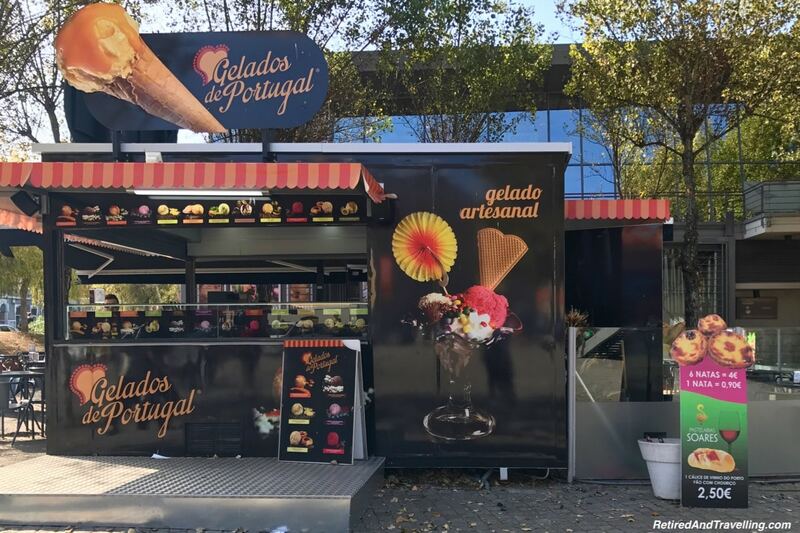 The next stop was a return to Lisbon and we knew we would find all kinds our favourite local specialties when we arrived. 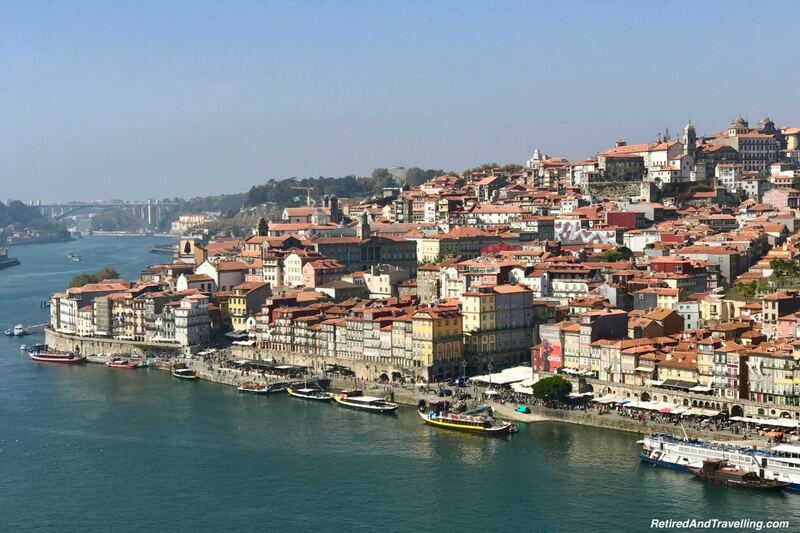 Have you done a port tasting in Porto? Did you find a favourite cellar that we should visit on our next trip? 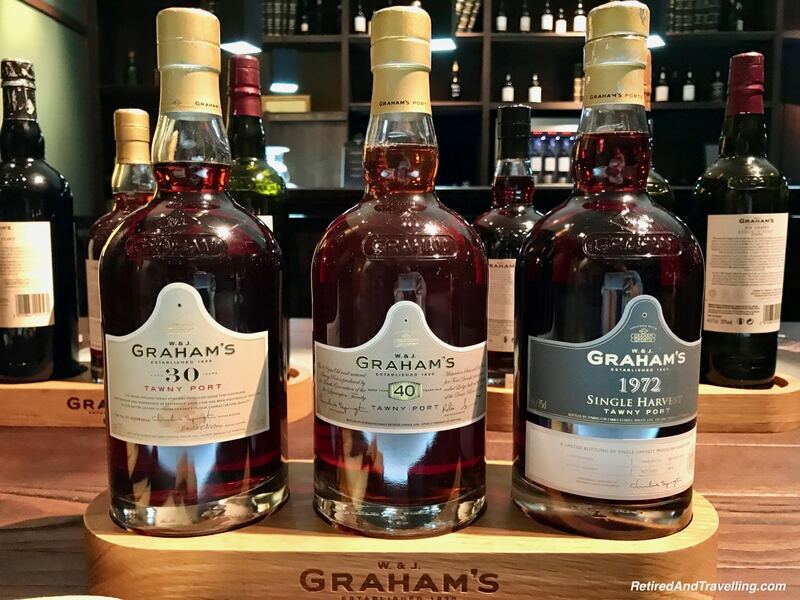 What a wonderful experience to have the private port tasting at Grahams 1890 lodge! 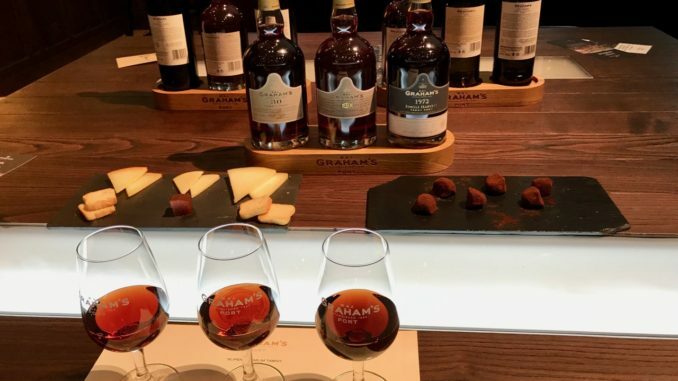 We really enjoyed our tasting there, but the chocolate and cheese sounds like we need to go back and see what we missed out on 😉 Loved reading about your Porto trip, it takes me back. Thanks so much for sharing!